Crazy Civil War Secret – The Coal Torpedo! When you think of something called a torpedo, you generally think of something that looks like a missile…but in the water. The word torpedo has morphed over the years. 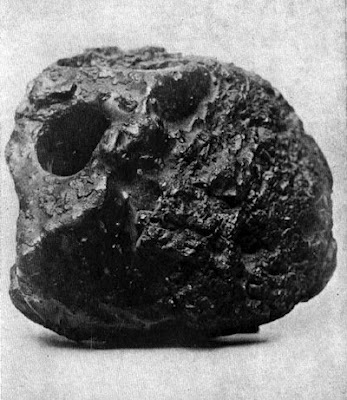 During the Civil War most booby traps or incendiary devices were called a torpedo….even the lumpy, meteorite-looking thing in this picture. Surprise! That’s not actually a meteorite. It’s a coal torpedo…used by the…get ready for awesomely potential book material…Civil War Secret Service! The thing is actually a hollow iron ball filled with gun powder, musket balls then its hole is sealed with beeswax and the entire thing is covered in coal dust. In order to sabotage the enemy’s steam-powered boats, trains and other vehicles that would make current steampunks grin like children at Willy Wonka’s place, operatives would sneak this primitive IED into the coalbox of those particular vehicles. Once shoveled into the boiler, it was only a minute or two before the explosives hidden inside ignited and things got ugly. These things were apparently no joke when they went off either. The equivalent of four Civil War-era hand grenades, these deadly 4 inch balls of unhappiness contained around 24 musket balls nestled in gunpowder. When it went off, the shell of the coal torpedo would become deadly flying shrapnel as well. Secondary explosions caused by these things were even more disastrous once the boiler blew. Because of their camouflaged appearance and the resulting damage caused to the original torpedo, evidence of what caused an incident completely disappeared. Posted in Cannonball, Destruction, Espionage, Explosion, Invention, War, Weapon | Comments Off on Crazy Civil War Secret – The Coal Torpedo! A few “unfortunate bounces” sent a cannonball through a local home after the Mythbusters crew misfired the gigantic projectile for an experiment. The ball missed several water barriers intended to slow it down, was sent skyward and shot clean through the homestead leaving entry and exit holes. 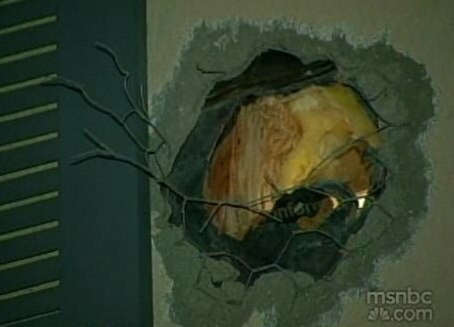 Which reminds me, did you guy ever heard about the urban legend where a TV show shot a cannonball through a house in Northern California? I wonder if it’s true or not. You are currently browsing the archives for the Cannonball category.